There was a danger last night during the bidding that too many observers were rooting for the young artists at Phillips to fail. Something close to glee greeted the within estimate prices for Oscar Murillo and Jacob Kassay as well as the failure of a Dan Colen work. At the same time, Banksy had two strong showings; and artists like Nate Lowman and Lucien Smith also performed very well. Phillips itself also seemed to have improved its performance, throwing fewer works against the wall and posting results within the estimate range rather than below it. Rosemarie Trockel’s more intimately scaled “Untitled” composition from 1987, made from knitted wool yet appearing cooly minimal and macho, sold for £116,500 ($189,895; est. £60-80,000/$98,500-131,000). Milan dealer Nicolo Cardi of Galleria Cardi was the underbidder. The Trockel last sold at Sotheby’s London, for £85,200 ($136,707), in October 2012—probably just time to realize a decent appreciation for the seller. Andy Warhol’s iconic “One Multicolored Marilyn (Reversal Series)” from 1976/86, which makes the screen goddess look like a ghostly negative, fetched £1,082,500 ($1,764,475), selling to London dealer Marco Voena of Robilant + Voena (est. £600-800,000/$985,000-1.31 million). A prime example from the resurgent Arte Povera movement, Michelangelo Pistoletto’s “Uomo con gli stivali al telefono” from 1970, made in the artist’s signature painted tissue on a stainless steel support, sold for £614,500 ($1,001,635; est. £350-450,000/$575,000-739,000). Pistoletto’s subject, casually dressed in a sweater, corduroys and high leather boots, leans against one edge of the frame, holding the old-fashioned instrument in a way that conveys its barbell like weight. Voena was the underbidder to the telephone buyer. 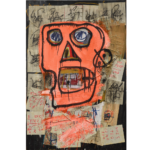 The work last sold at Christie’s London in February 2007 for £240,000 ($471,600).